First, thank you so much to all who sponsored me. Once again, when that infamous ‘wall’ – bane of all Marathon runners was struck – this time 5 kms after last time at 32 kms, you once again carried me through. Having sponsors means I cannot even contemplate dropping out. 200 metres to go… Will I ever just once look happy at this stage? This was a great Marathon. Must humoured prior to the start by repeated announcements warning us to be aware of the ‘soaring temperatures’ likely to reach 22 degrees. Yes not a typo. 22. Wow. Sunscreen on, gallons of water on board. I guess I am blessed to be able to train in Spanish temperatures where one dreams of 22 – the cool period of the day in which to run. I did find it amusing that the Danish headline the next day ran; ‘The heat slaughters the Marathon runners’. It all depends what you are used to. However glorious sunshine in this most beautiful of cities – I had forgotten just how amazing my one time capital is – meant what was missing from Lisbon was present here; crowds, huge crowds, huge cheering crowds all the way through to the end. And anyone who has done one of these will know how that lifts. On the other hand what was apparently not present all the way until the end was; yours truly. 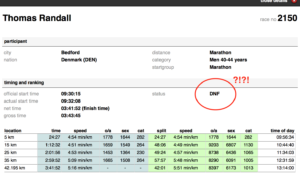 According to the official website I made it through 42,195 km, before… DNF?! The site at one point displayed the rather dramatic; ‘last seen at’… I can only hope they have stopped looking. So THANK YOU to those who donated once again and thank you to all the thousands of supporters who cheered us through the sun drenched streets of Wonderful Copenhagen. I have already signed up for the next one – my first attempt at 2 in one year, but if I want to beat 3 hours and 30 minutes, which I do, best get to it as soon as possible. ~ by 2ndcupoftea on May 23, 2016. Well done Thomas – always a challenge to run that long. Best wishes for the year ahead. Thank you so much… now when are we travelling together again?! Been too long already. Was in Luton today – always reminds me how random that you know that place. Many hugs to you both. Bravo Thomas! 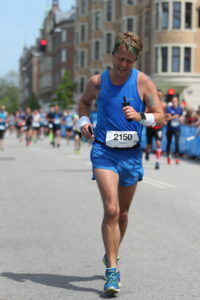 Check out our Bolder Boulder run for next May…and you can stay at “Hotel Hawley.” Happy travels. But what about the leg/knee problems you mentioned earlier this year??…. Congrats on finishing! The DNF is annoying, but you know you DF and have your pictures and memories to prove it. Doing a Fall marathon on your already great base seems like a good idea. Keep us posted! I continue to run at a brisk walking pace and will soon start training for my 21st Half. I get what it takes to do what you do! So, your next Marathon must be coming up real soon? Keep us all posted.